With luxury as your backdrop, getting married in Hawaii lends itself to an endless array of color palette and décor options. Luckily for us, each of our couples are different and this allows us to design each and every wedding to be unique to who they are as a couple. 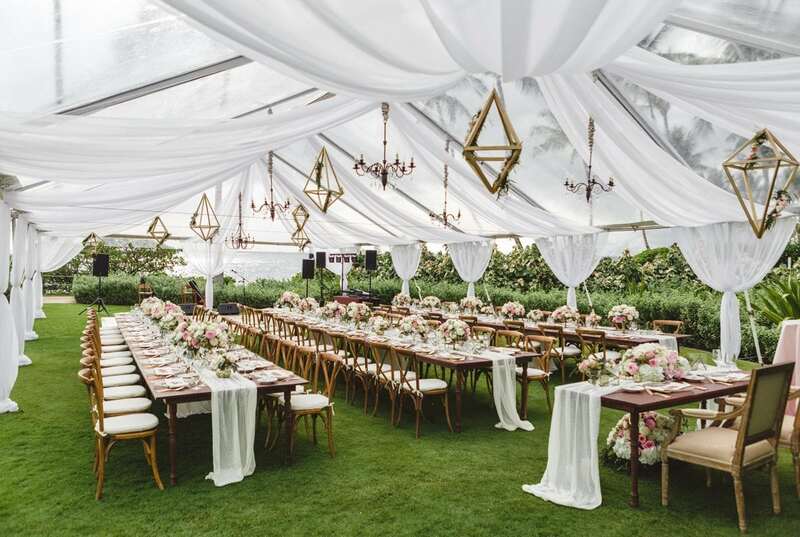 Whatever your style, building the perfect color palette that embraces the vast landscapes, venue options and cultural elements the Hawaiian islands have to offer will guarantee a harmonious compliment to the existing rich opulence that is o-so-Hawaii. Do you dream in color? We sure do! 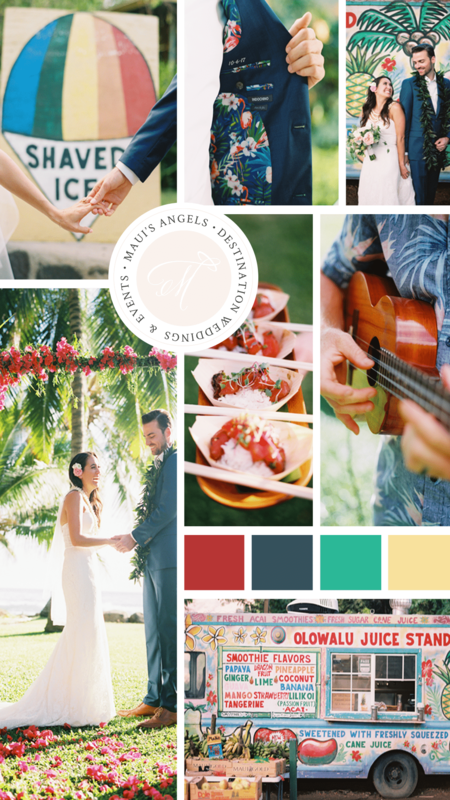 It’s no surprise that a destination wedding in Hawaii can be FULL of bright and vibrant colors and these creative color combinations simply speak for themselves. Sabrina and Rory were married at the Olowalu Plantation House in a beautiful oceanfront ceremony followed by an intimate reception with their closest friends and family. Directly across the street from the venue sits the well known Olowalu Juice Stand that lacks nothing short of- you guessed it- color! After saying “I Do” under a brightly dressed floral arch, the newlyweds chose to sneak away for a little photoshoot with their photographer Wendy Laurel. If you follow Wendy, you already know that color is the name of her game! The juice truck, fruit and adorable shave ice sign made for colorful backdrops and the scheme was carried out through all of their wedding day details. Now this color palette is SO dreamy! As much as we love color, there is something so stunning and romantic about a soft and elegant combination of white and steely blues. Hawaiian based photography NV Maui Media captured this couple and their classic high style just perfectly. With the dark island greenery and endless ocean views, you can see why our couple chose to keep their design choices light and airy. 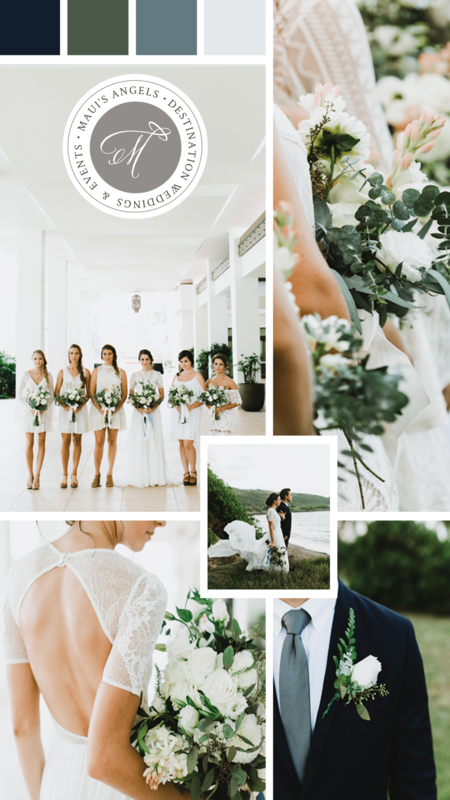 The bride and bridesmaids carried soft fresh bouquets in creamy whites and garden greens- the absolute perfect pairing for their destination wedding on Maui. 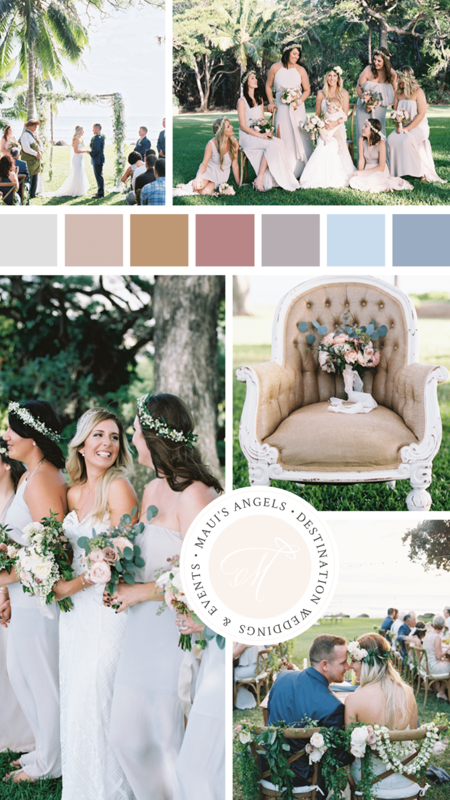 This color palette has Maui’s Angels written all over it! Bride Brianna wanted to keep her wedding design soft and elegant while incorporating tons of vintage Hawaiian details and stylish touches. 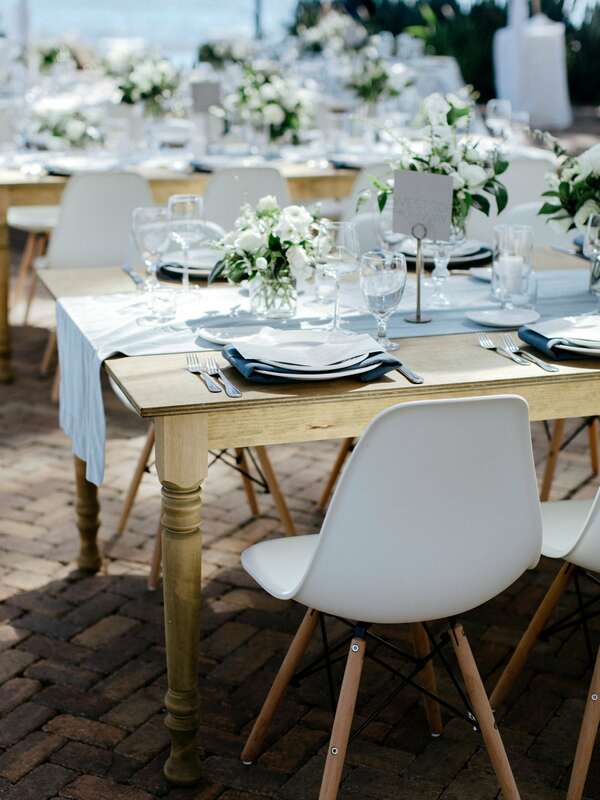 Choosing a mixture of pastels and natural finishes gave us plenty of options when considering rentals, tablescape decor and floral design. The bridesmaids blush tone dresses paired beautifully with their garden style bouquets and baby’s breath haku floral crowns- a must have detail for your wedding here in Hawaii. 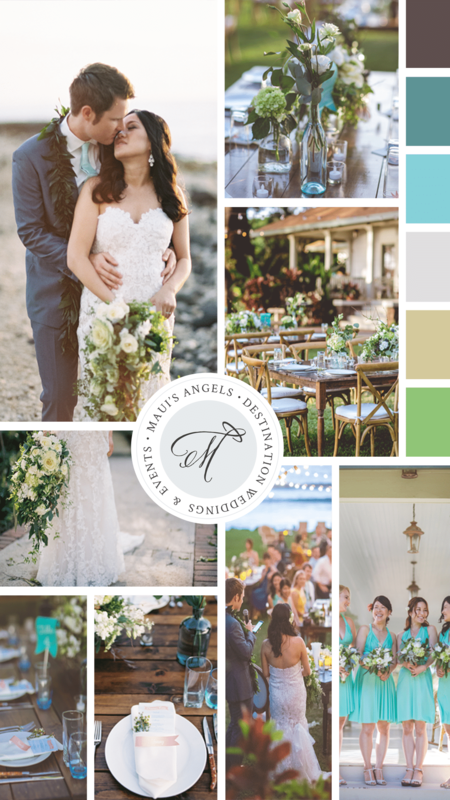 It’s easy to see why blues and greens work beautifully when designing a wedding on Maui. Considering your venue and backdrop are an absolute must to achieving a cohesive look that your guests are guaranteed to notice and feel. The pairing of rustic farmhouse dining tables and vintage cross back chairs made the perfect contrast to the bridesmaids bright aqua dresses and blue tabletop accents. By adding fresh greenery in the bouquets and centerpiece floral, a soft touch to the wooden tables was all that was needed to bring this memorable color palette to life. Color is all around us, especially here on the beautiful Hawaiian islands and we can’t stress enough how important it is to be YOU when designing your wedding day decor. We love every opportunity to work closely with our couples and assisting them in designing the wedding experience they have always dreamed of. Warmest Aloha from our team at Maui’s Angels Weddings!